Ogunquit-Mariner: Fish are tourists too! It's no coincidence that shortly after we open our doors for the season at The Mariner Resort, the striped bass migration makes its way into our local tidal rivers. After all, is there any other reason to be in Ogunquit if The Mariner isn't open? ;).....okay, maybe there's a few. If you were to ask a local fisherman, "What brings the stripers to Ogunquit this time of year--every year?" 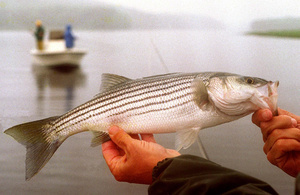 They might respond with some fisherman type jargon--such as "The presence of bait fish", or "Rising water temperatures", but we at the Mariner Resort figured out the "real" reason why stripers are here. After countless hours of research, sleepless nights, and more pie charts than one man handle the-- staff at The Mariner Resort developed the formula to prove once and for all, Why striped bass come to Ogunquit around this very same time each year...... Our great mid-week specials!! Duh! With such great prices this time of year, not even the stripers can resist a trip to beautiful Ogunquit. So don't let those fisherman fool you. The real reason why the stripers are here is because the Mariner Resort is open for the season, and we offer such irresistible mid-week specials this time of year. Be sure to set the hook on great deal before they are gone!